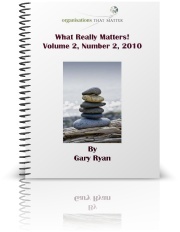 My 6th ebook, What Really Matters! Volume 2, Number 2, 2010 has just been released. The focus of this ebook is personal and professional development. Developing the skills outlined in this book will enhance your employability. You can access the ebook and other free resources here. Please share any thoughts that you have regarding the topics that should be included in the next ebook in this series, due for release on October 2010.